Here's all you need to know about this weekend's Cape Town Marathon (and all the other events). Make the most out of your weekend festival of running. From vital race information to where you friends can support, to where to park; here’s all you need to know about this weekend’s Cape Town Marathon (and all the other events). The Sanlam Cape Town Marathon fun run and trail runs take place on the 22nd September and the Marathon and 10km take place on Sunday the 23rd September 2018. The Sanlam Cape Town Marathon Registration and EXPO will take place at the Century City Conference Centre (No. 4 Energy Lane, Bridgeways Precinct, Century City). Century City is strategically located on the N1 highway, just a few minutes from Cape Town CBD. Century City is centrally located in relation to the greater Cape Town metropole, with easy access from the CBD, the popular Victoria and Alfred Waterfront, and the Southern, Northern and West Coast suburbs. Take time to visit the many stands to check out the latest in running technology or stock up last minute race day essentials. If you are coming to the event in your own vehicle, allow enough time (cater for heavy traffic in the area), do not park illegally and ensure that you have a plan as to where you will park. The Traffic Police will enforce the law and will issue fines, and may tow away vehicles that are illegally parked. Cars may be parked in the parking areas in and around the Green Point Common. Participants can also park at the V&A Waterfront, which is paid parking. Free parking – Cars may park P1, P2, P10 & P13 parking areas in and around the Green Point Common (PLEASE NOTE: Many of the roads in this area will be closed from 06:00am onwards, so arrive early as parking will fill up on a first-come-first-serve basis. P1 & P2 – Due to the road closures around the blue and yellow start areas P1 & P2 access is ONLY from Portswood Rd into Fort Wynyard Rd directly into the P1 entrance (via P2 parking area). This access will close as soon as parking area is full, estimated to be before 6am. Paid parking – Participants can also park at the V&A Waterfront, which will be for their own account. Please note that no parking is allowed in Beach Road, Haul Road, Granger Bay Boulevard, Fort Wynyard, Portswood Road, P4, P6, P12, parking in front of Gallows Hill & Prestwich Street. A free MyCiTi shuttle service will run between the Civic Centre and the Stadium Stations from 04h45 to 06h15 every 5 minutes and from 08h30-14h00 every 20 minutes for the return journey. Marshalls at the Stadium Station will direct runners to their appropriate starting points. Please note that this is a free service. This option means that you can find parking and gain quick, easy access to the start and back to your vehicle later. Parking facilities have been provided for at Civic Centre. Eating is prohibited on the busses. Click here for road closures. There will be a tog bag drop-off zone and pick-up zone at the start and finish for both of the Sunday’s events. Two Special Licence Numbers (bibs) have been issued with permission from ASA. These bibs may cover the normal ASA permanent licences. The ASA permanent licences do not need to be worn or displayed. Race numbers are not to be worn on shorts. Running in your athletic-club colours is encouraged (no club colours, no qualification for team prizes); non-club members must run in non-branded running gear. Age group tags are indicated in the marathon race number and can replace the material age numbers. The letter in front of your race number indicates your seeding pen. 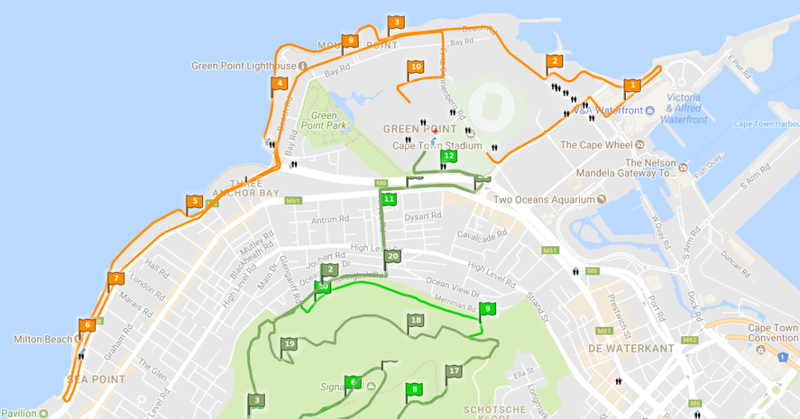 The Marathon Start (BLUE START) is at the corner of Granger Bay Boulevard and Beach Road, Green Point. Please familiarize yourself with the start area before you arrive and follow the directional signage. 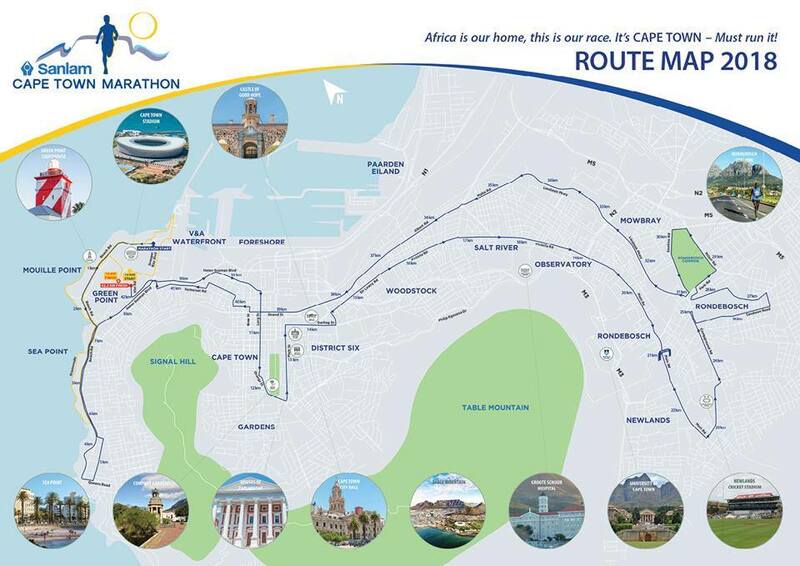 The marathon start can ONLY be accessed from Granger Bay Boulevard (at Beach Road circle) and Portswood Road. NO ACCESS WILL BE ALLOWED FROM BEACH ROAD AT THE FRONT OF THE RACE, YOU MUST FEED IN FROM THE BACK. START TIME: 06h40 – Please be in your designated seeding pen by 06h00. Your FRONT race number is the number with the Finishtime disposable timing chip attached. Please do not bend or fold your race number as this could affect the antennae and the signal capability of the chip. There are water stations situated at every 3–5km or less. Both Coca-Cola and water will be available. There are three water stations that will have Powerade available. To find out more about how much water to drink on race day visit our website. FOR ANY MEDICAL EMERGENCIES CALL 021 417 4150. There will be a full medical tent at the finish, and a medic with a golf cart will assist with the transport of injured runners to the race hospital. Information relating to runners who have been admitted to the medical tent will be available at the information centre, located on the field at the finish. Several mobile ER24 ambulances or Medical Personnel will be stationed approximately every 5km along the route. Please DO NOT LITTER by just dropping your water / energy sachet/s in the road or on the pavement, the race will be providing many ‘Chuck Zones’ and ‘GARBIE BINS’. Please be on the look-out for one and dispose of your sachet in the bins provided, or carry the sachet till you can throw it away. Due to IAAF requirements the race organisers will be strictly enforcing cut-off times in certain locations. There will be pick up busses for all athletes that do not make the cut-off times at the following points. Roving pick-ups will also take place throughout the race. So, grab a cuppa and join those wonderful Capetonians that make this city such an awesome place to live – those who have taken up the initiative in creating these spectator zones: the communities, the sponsors, the needy charities and now you our unofficial ambassador! 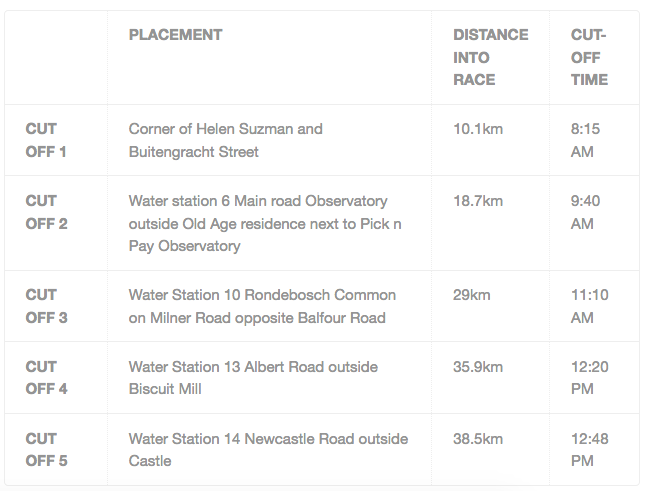 There will be water stations at the Glen Road and Signal Hill parking lots (22km long course water stations will be at 8.2km’s and 15.2km’s). We encourage you to run carrying a minimum of 500ml. Only water will be available at the water stations. Please note: Wildrunner have gone cupless with all our trail running events, so should you wish to make use of the water stations, be sure to bring along a re-usable eco cup (for sale at pre-registration) or run with a bottle or hydration pack that you can refill. There will be toilet facilities at the ablution block at the Signal Hill parking lot, as well as at the start and finish. Mediclinic are our medical partners, and will be looking after you on race day. A medical point and ambulance will be placed at the Kramat on Signal Hill. In the Greenpoint area, a mobile-doctor vehicle will cover shorter routes. There will be a full medical tent at the finish. A medic with a golf cart will assist with the transport of injured runners to the race hospital. Cars may be parked in the parking areas in and around the Green Point Common (P3, P5, P6 & P4). Participants can also park at the V&A Waterfront, which will be paid parking (Breakwater Parking Garage and The Lookout). For more information, visit https://www.capetownmarathon.com/.